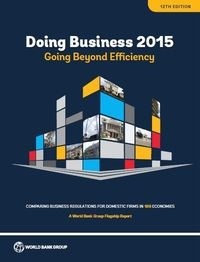 Doing Business 2015: Going Beyond Efficiency, a World Bank Group flagship publication, is the 12th in a series of annual reports measuring the regulations that enhance business activity and those that constrain it. Doing Business presents quantitative indicators on business regulations and the protection of property rights that can be compared across 189 economies—from Afghanistan to Zimbabwe—and over time. Doing Business also measures labor market regulation, which is not included in this year’s ranking.Data in Doing Business 2015 are current as of June 1, 2014. The indicators are used to analyze economic outcomes and identify what reforms of business regulation have worked, where and why. This year’s report introduces a notable expansion of several indicator sets and a change in the calculation of rankings. Each economy from the 189 economies measured is evaluated based on how close their business regulations are to the best global practices. A higher score indicates a more efficient business environment and stronger legal institutions.